Palestinians in Beit Sira village, in the central West Bank, Friday, staged a demonstration calling for the immediate release of the bodies of the 2 slain Palestinian young men, killed by Israeli forces on Monday, March 4, 2019. Local sources told Maan that 5 Palestinians were injured, one critically, during the ensuing clashes, unarmed youth hurled rocks at Israeli forces, who showered the protesters with live ammunition, rubber-coated steel bullets, tear-gas bombs, and sound grenades at the crowd to suppress the march. 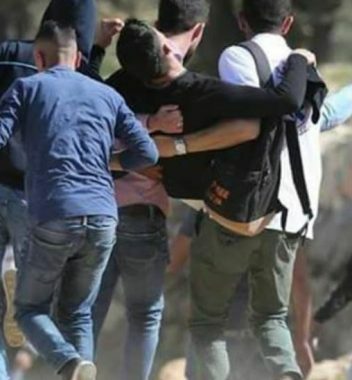 In related news, Israeli forces shot 3 Palestinians with rubber-coated steel bullets, and caused dozens more to suffocate from tear gas exposure, in the weekly protest in Kufur Qaddoum, Friday.